Thanks for a great 2018 and Happy New Years to all! 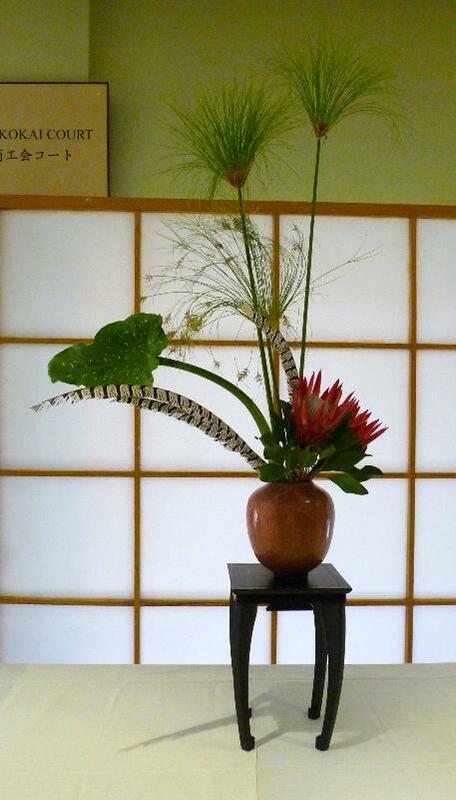 We are very happy to announce that Professor Hirokazu Yokohigashi from Japan will be leading a two-day workshop on Thursday May 23rd and Friday May 24th and celebrating our Chapter 45th Anniversary Floral Exhibition and 90th anniversary of Japan-Canada diplomatic relations which is scheduled on Sunday May 26th, 2019 at noon 12 pm to 5 pm at the Japanese Canadian Cultural Centre Kobayashi Hall. The demonstration by Professor will start at 2 pm. Please noted that the Workshop registration is full and closed. Show flyer. The annual general meeting will be held on Sunday, June 23rd, 2019 at the Banbury Community Center. The February Workshop "Driftwood" was held on Sunday, February 24th, 2019 at the Banbury Community Center. Thanks to everyone who participated! The December Workshop "Festive Workshop" and potluck was held on Sunday, December 9th, 2018 at the Banbury Community Center. Thanks to everyone who participated! The November Workshop "Rimpa Arrangement" was held on Sunday, November 18th, 2018 at the Banbury Community Center. Thanks to everyone who participated! The September Workshop "Middle-View Landscape" was held on Sunday, September 16th, 2018 at the Banbury Community Center. Thanks to everyone who participated! The 44th Annual Spring Show was held on Sunday, April 15, 2018 at the TBG. Although the weather was not cooperating, we still managed to have a very successful show! Thanks to everyone who participated! The February Workshop was held on Sunday, February 25, 2018 at the Banbury Community Centre. Thanks to everyone who participated! The December Festive Workshop and Potluck was held on Sunday, December 10, 2017 at the Banbury Community Centre. Thanks to everyone who participated! Our November Morimono Workshop was held on Sunday, November 12, 2017 at the Banbury Community Centre. Thanks to everyone who participated! Our September Workshop, Garden Tour and Potluck was held on Sunday, September 17, 2017 at Mrs. Bev Sutton's Garden. Thanks to everyone who participated! Our June Workshop by Grand Master Akiko Bourland was held on June 17th, 2017 & June 18th, 2017 at the Toronto Botanical Gardens (Studio Room). Thanks to everyone who participated and helped out! Check the Gallery for pictures! Our 2017 Annual General Meeting (AGM) with Potluck and Pottery Sale was held on May 28th, 2017 at the Banbury Community Centre. The 43rd Annual Spring Show and Honoring Canada's 150th Anniversary held on Sunday, March 26th, 2017 was a great success! Thank you to everyone who participated and helped out! Be sure to check out our Gallery for pictures. The December Festive Workshop and Potluck was held on Sunday, December 11th, 2016 at the Banbury Community Centre. Our November Workshop was held on Sunday, November 13th, 2016 at the Banbury Community Centre. Our "Free Style in an Interesting Container" Workshop was held on Sunday, September 18th, 2016 at Markham's Buddha's Light Centre. The AGM and Potluck Luncheon was held Saturday June 4th, from 10:30 am to 12:30 pm at the Banbury Community Center in Toronto, in the Meeting Room (2nd floor), located at 120 Banbury Road, North York. Our Chapter presented our annual Spring Floral Show on Sunday, April 17, 2016 at the Toronto Botanical Gardens, Garden Hall. From noon to 4:30 pm, with the official opening ceremony at 1 pm, there were demonstrations by Senior Ohara Masters at 1:30 pm and 3:00 pm. Tickets at the door were $7. Our Chapter is pleased to announce that it is the Host School for the upcoming Ikebana International Toronto Chapter autumn show entitled Autumn Leaves, held on Sunday October 18 (12 noon to 5pm) at the Japanese Canadian Cultural Centre located at 6 Garamond Court in Toronto. The 41st Annual Ohara Spring Show will be held on Sunday April 12, 2016 at the Toronto Botanical Gardens from 12 noon to 5pm. In addition to the wonderful display of spring arrangements, there will be demonstrations throughout the afternoon, a tea room offering refreshments and snacks, as well as the raffling of tea room floral arrangements. Tickets may be purchased from members, or at the door. Our 2015 Annual General Membership Meeting & Potluck was held on Sunday May 31 beginning at 11am at the Banbury Community Centre located in Toronto at 120 Banbury Road. We had our meeting, followed by the annual Potluck Luncheon, by members bringing an item of food or drink to share.